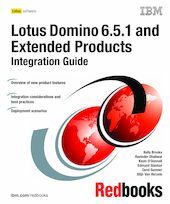 This IBM Redbooks publication discusses how to install, configure, and integrate Release 6.5.1 of IBM Lotus Domino and the Extended Products. Release 6.5.1 of Lotus Domino and the Extended Products represents a significant change in the way Lotus delivers software for customers. Each product in the 6.5.1 family is developed, tested, and supported to run with the other Release 6.5.1 products. For example, IBM Lotus Instant Messaging and Web Conferencing (formerly called Sametime) 6.5.1 and Lotus Team Workplace (formerly called QuickPlace) 6.5.1 will run on Domino 6.5.1. Customers will no longer need to spend time wondering (and testing) which version of which product works with which version of Domino. This translates to faster time to value for customers by enabling them to upgrade more frequently and more easily. The audience of this book is a network administrator or IT specialist who wants to introduce or integrate Release 6.5.1 of Domino and the Extended Products. In addition, business executives, system architects, and IT specialists who want to better understand the collaborative benefits, the product features, integration points, and configuration requirements between Domino 6.5.1 and the Extended Products will benefit from this book.